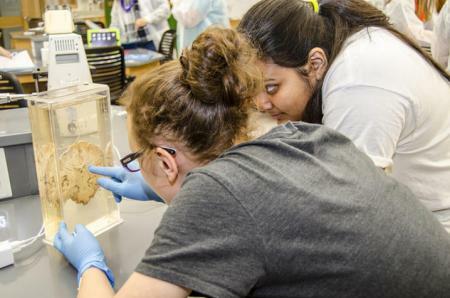 Sometime during the transition from middle school to high school, girls often find their early interest in science and math steered in other directions, often toward careers that fit comfortably into a box of more “traditional” women’s roles. 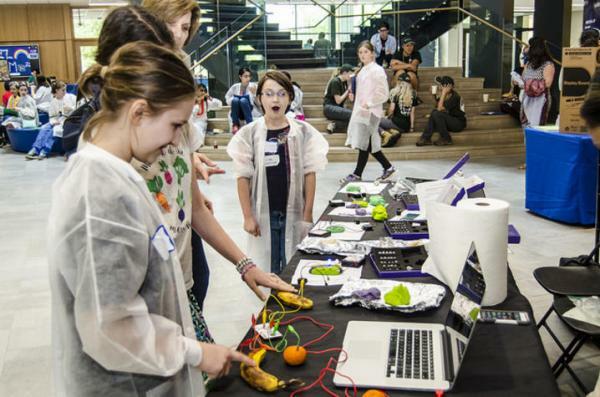 A recent daylong workshop at the University of Kentucky sought to stem that tide by introducing 120 Kentucky middle school girls to a challenging STEM career. A multidisciplinary project, Expanding Your Horizons, focused on countermanding some of the possible reasons that girls’ interest in the sciences flag at a certain age, such as peer pressure or a lack of female role models. 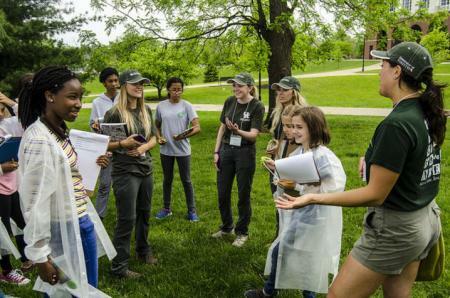 During the workshop, the young students met many female undergraduate and graduate students studying STEM disciplines at UK who introduced them to a large variety of topics, such as the ecological impact of trees, water treatment and purification, neuroscience, chemistry, electrical engineering and molecular gastronomy, just to name a few sessions that day. It was funded by a grant through the Kentucky National Science Foundation EPSCoR (Experimental Program to Stimulate Competitive Research) Program through an Education, Outreach, and Community Award. Susan Odom, an Associate Professor in Chemistry in the UK College of Arts and Sciences, and Bradford Condon, postdoctoral scholar with University of Tennessee’s Department of Entomology and Plant Pathology and UK Department of Plant Pathology, also served as coordinators of the conference. Christy Payne, an Associate Professor in Chemical Engineering, organized an Opportunities Fair, which took place over lunch. About 20 organizations from campus and the Lexington community were represented. Women continue to be underrepresented in STEM fields, making up only 24 percent of the workforce according to a study from the U.S. Department of Commerce. A U.S. Census Bureau publication states that African Americans and Hispanics have been consistently underrepresented in STEM employment. In 2011, only six percent of STEM workers were black and seven percent were Hispanic. Catherine Denning is pursuing her doctoral degree in chemistry at UK. She was excited to participate in the workshop to share her experience and enthusiasm for her chosen field. 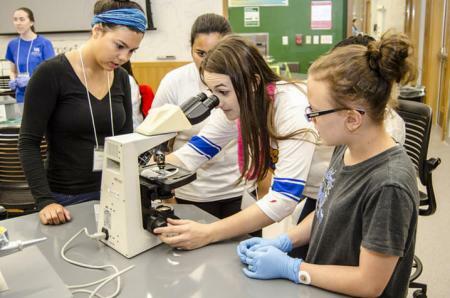 For the better part of a Saturday, the widely diverse group of girls filled the halls of the new Don and Cathy Jacobs Science Building and immersed themselves in workshops led by UK students, who had been mentored by UK professors prior to the workshop. 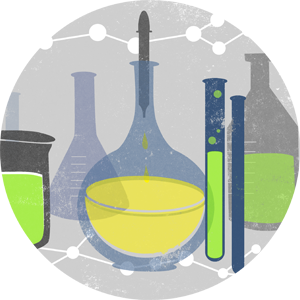 In one laboratory, a group of undergraduates introduced middle schoolers to water treatment. After contaminating water samples with substances like coffee grounds and lemon juice, the young students came up with a hypothesis on how a particular substance changes the water, then devised ways to remove the contaminant. Outside, another group of students followed Amelia Baylon, Hunter Dykes, Emily Mastoroudis and Chloe Vorseth, seniors in the Natural Resources and Environmental Science degree program. As they ventured onto campus, they showed their charges how to measure a tree’s diameter and, from that, determine its value in the landscape, including how much storm water it intercepts, how much energy it conserves, the amount of carbon it sequesters and what it adds to the property value. The middle schoolers came from all walks of life, some with a fascination for insects, some interested in the medical field, others liked to build things. For some girls, it was their first experience with a university environment. Many of them were Sherry Blosser’s students at Henderson County North Middle School. Blosser, a sixth- and seventh-grade science teacher, brought 45 students to the workshop. She opened up the trip to girls who were the most academically advanced and those who might have academic or discipline issues.